We are well into fall, but I am still glowing over the memory of our family trip to Yellowstone this summer. Susan and I drove our four kids on their first trip to the Rockies, through South Dakota and Wyoming to our country’s oldest national park. Like many families that make such a trip, we stopped at Wall Drug, located in Wall, S.D., about 75 miles east of Mt. Rushmore. This tourist attraction is a testament to the power of hospitality. Furthermore, the family that owns Wall Drug subtly but effectively evangelizes the importance of their faith every time they tell their story. The store’s website explains that when Dorothy and Ted Hustead set out to find a place to open a pharmacy in 1931, they looked for two things: a town that was small and a town that had a Catholic Church. They explained that after visiting with “the priest, the doctor and the banker” in town, they decided to settle in Wall. Business was slow until 1936, when Dorothy noticed all the people driving by on their way to Mt. Rushmore. Work on the monument began in 1927, and people began traveling to see it, even before it was completed in 1941. Dorothy saw how thirsty they all looked and suggested to Ted that they offer free glasses of ice water. They put up signs along the highway, and within a week hundreds — and then thousands — of people began showing up for a free glass of water, and to buy soda, ice cream and other drug store staples. Today, Wall Drug is a mega-tourist attraction, serving some 20,000 people a day during the summer. The little drug store has grown into a 76,000-square-foot entertainment complex that includes some 22 stores, restaurants, an art museum, a water show and other attractions, such as an 80-foot dinosaur statue and a 6-foot rabbit. There’s also a chapel. They still give away ice water, and for a nickel you can get a cup of coffee. 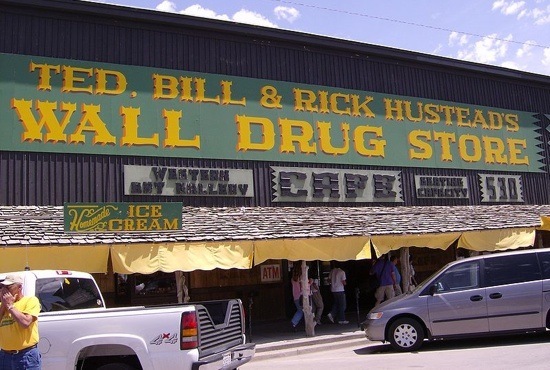 Run by the third generation of Husteads, Wall Drug is a major employer and is known all over the world. Rick Hustead, chairman of Wall Drug, told me the chapel gets plenty of use. Although it serves all denominations, he said he keeps it stocked with brochures about how to pray the rosary. Each year, Wall Drug hosts some 100 college-age workers from around the world. A young woman from Spain served us in the restaurant when we were there. International students make up about half the Wall Drug workforce during the summer. The store puts them up in 32 houses it owns in the area. “We couldn’t do it without them,” Hustead said in a phone conversation. The federal government shutdown earlier this month meant the closing of Mt Rushmore and Badlands National Park, which is about eight miles away. Hustead said Wall Drug contributed $15,000 to a fund collected by the state of South Dakota to open the national parks during the shutdown. “People came from a long way and found the parks closed; we had a number of people disappointed, so we wanted to do something,” Hustead said. Wall Drug added a lot to our memory of this family trip; if we get back that way, I’m certain we will stop in again. Author Tom Bengtson is a local small business owner and writer. You can contact Bengtson by visiting his website.